I have been coming to the town of Ipoh for almost 20 years now and yet it still remains an enigma to me, and I suspect many who visit. Like the many thousands on this annual migration, we are here for Chinese New Year to visit relatives, my wife’s relatives who are here in great numbers. 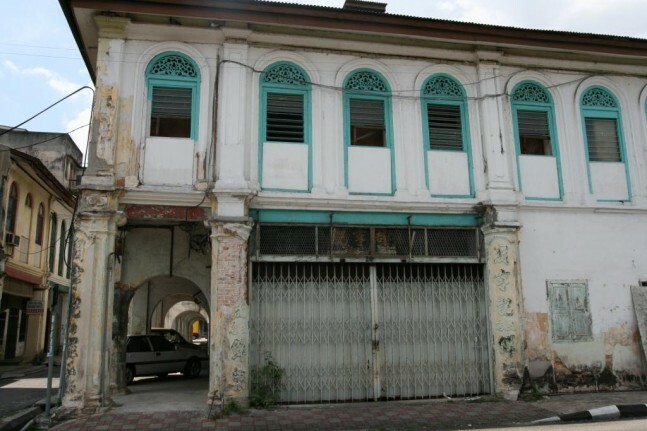 It is a curious swell of the population, as if everyone from Malaysia and Singapore has their roots in Ipoh. Just mention Ipoh in conversation and most will have relatives or friends there. And then there’s the water. Everyone seems to know Ipoh has special water. This is what makes Ipoh noodles so superior; the silky smoothness made so by the waters of the Tanjung Rambutan waterfalls nearby. I can relate to this as much as any Ale or Malt Whisky enthusiast knows it’s all about the quality of the water. We all know of the Ipoh girl too; beautiful, tall, high-cheekbone Chinese woman with silky smooth skin and Teochew fair complexion, twins of Michelle Yeoh everywhere and all because of the water! This surge of human traffic is paradoxical though for local businesses; a boon that they gain little from as the whole town is practically shut over Chinese New Year, except the supermarkets doing a roaring trade in spreading mediocrity. I often think there should be some sort of Ipoh Grand Fair and National Hawker Stall Concurs held over these few days, and people would come in their droves. But I guess that is not quite the tradition, like Christmas this is supposed to be a time spent at home, a time of family bonding and home-cooking. Then no sooner have the New Year’s celebrations begun; the Yusheng (Yee Sang) ‘Prosperity Toss’ (Teochew-style raw fish salad) tossed, the Lion Dance’s performed and firecrackers louder than artillery filling the air with acrid smoke, and Hóngbāo (Ang Pows – red envelopes containing money that symbolise good luck and prosperity) passed around, there is the mass exodus, back to the place we toil. Ipoh returns to its normal quiescence, a city that is a shadow of itself from its heydays of the tin mining boom in the early 19th Century, a time of colonial enterprise and great prosperity for both conqueror and indigenous. Many fortunes were made – and lost – in this epoch as can be seen in the splendid mansions and stately buildings; some have lost none of their grandeur whilst others are decaying edifices. It is the inner cities decay that baffles me most with its two parts; the so-called “New Town” with its pre-World War II shop houses grimy in mould and road dust crumbling with concrete gangrene, some strangled by tree roots and vines, yet these buildings still retain their architectural character and have so much potential – if anyone cared. Across the Kinta River, “Old Town”, in parts, is still resplendent and certainly more manicured with wonderful period architecture; the mock-Tudor St. Michael’s Institution built in 1912 now a school, and there’s the Municipal Town Hall in all its Edwardian Baroque stateliness. 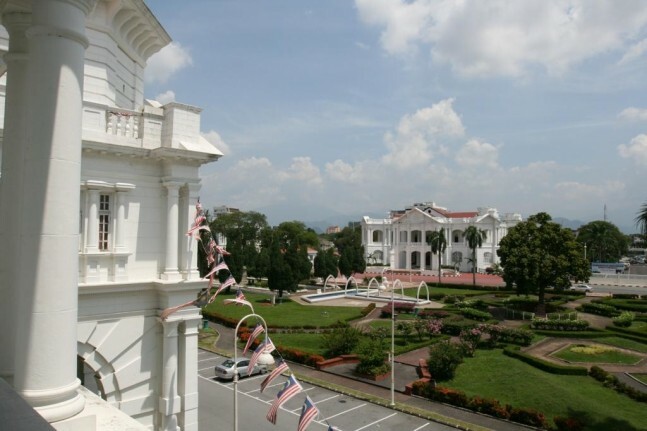 But it is the Ipoh Railway Station that is my favourite; a blend of neo-classical-Edwardian Baroque and Moghal-style, it is building that has all the majestic grandeur of the day and comparable in stature to Melbourne’s Flinders Street Station, yet colloquially nicknamed the “Taj Mahal of Ipoh”. Sure it still looks splendid on the outside, in its new coat of white paint, but venture inside and see the degradation; a cheap, by-the-hour grungy hotel; how ironic, a symbol of love it is indeed. Every time I explore this building I have fantasies of restoring it to its grand old days with Salons and gin & tonics at five o’clock; but who would come. And who would name a town after a tree with poison sap that the indigenous Malay used to coat the tips of their darts for hunting is ominous, and yet it grew and grew, and grew to become a fully-fledged city, now known as the “Dead City”, a place to retire – literally. Still, it remains one of the largest cities in Malaysia with a population of 700,000 and well over a million if you include the total urban area. And to me, it looks like it is growing again with shiny new Government buildings, malls and shop houses sprouting in Jelapang and row up row of new housing developments with the bricklayers sights set as far as Chemor; one hears of a massive sprawl northwards, least that’s what the developers say, meanwhile the “Old and New Towns” rot, such is the norm of progress? In the early days (Circa 1990) we used to fly to Ipoh from Kuala Lumpur or Langkawi Island with Malaysian Airlines but they axed the routes, which drove another nail into the coffin. I remember, or I should say, my wife reminds me constantly of the time I deferred our flight from Ipoh to Langkawi as the hotel had pleaded with me to come the following day as they were seriously overbooked. Not realising the flights only operated out of Ipoh twice a week we ended up driving up to Kuala Kedah and taking the ferry – a harrowing all day ordeal along the lines of Redmond O’Hanlon’s “Into the Heart of Borneo”. About six years ago, AirAsia began flying from Senai Airport (Johor) to Ipoh and with demand outstripping seats some bright spark had the ingenious idea of upgrading the aircraft from Boeing 707s to the much larger and more efficient Airbus A300, only they did not check with Ipoh airport on the specs – the runway was too short for the aircrafts landing requirements! Ten years later they have only just started work on extending the runway. Ayah! You get used to these sort of dysfunctional things in Malaysia; motorways that come to an end and U-turn into an urban suburb, theme parks that open in the middle of nowhere with predications of tourists coming in their millions only to be closed in next to no time, some not opening at all, but the contractor grins. However, Firefly, an offshoot of Malaysian Airlines, has started a daily direct flight from Singapore to Ipoh, much to the elation of Singaporeans who think nothing of jumping on plane to track down a decent bowl of Sar Hor Fun. It’s a painless 1 hour 30 minute flight in twin-engine turbo-prop that is relatively reasonable value in the peak periods at around 500 Ringgit return – bearing in mind the airline has a monopoly on the route – and at certain times of the year significantly cheaper. Trust me, this is a whole lot more convenient than an arse-numbing, monotonously boring 8 to 9 hour drive from Singapore on a motorway plagued by road death and banditry, and that’s if you leave at stupid-o’clock around Chinese New Year, otherwise you will can be sure of a 6 or even 8 hour grind from Kuala Lumpur to Ipoh, which would normally take about two and half hours. More signs of rapid urban development approaching, there is now a direct commuter electric fast train (an oxymoron in Malaysia) that runs from KL Railway Station with one stop at KL Central that has you in Ipoh in 2 hours. Ah, but that’s only the once a day ‘Platinum’ service at 45 Ringgit each way. 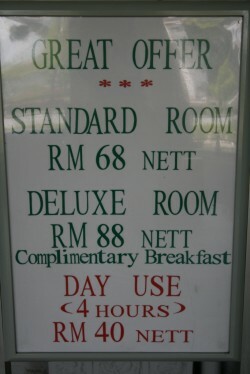 You see the other services, ‘Silver, Gold’, have more stops, hence a longer trip and time is money in Malaysia. So here we go again, we are in town to welcome in the Year of the Black Water Dragon. After 20 years of the same routine, and menu, it’s getting to feel a little like Groundhog-day; yet there is something reassuring in this habitual ritual and I can still remember my first visit as clear as the very day. This coming out had all the classic awkwardness of a bloke meeting the parents for the first time however it is more the extended family in Chinese culture one needs seek approval, and most of all Great Grandma, or Ah Ma, and the matriarch of the clan. Gathered for New Years day dinner, I was summons to take my place next to Ah Ma, sitting at the symbolic head of an enormous round table with 20 or more seated. Ah Ma was offered every dish first, so she could have the choicest pieces, then the dish offered to me, as guest of honour. The succession of dishes was never-ending, but being polite, I took a generous portion of everything and woofed it down, occasionally trying to compete with Ah Ma in audible belches of gratification acknowledging the fine cuisine. I had brought along a several bottles of wine, to impress, and there was beer, whiskey, cognac and tea, all served simultaneously with a row of glasses in front of us, and a succession of cheers with the insistences that all of them by drained – then refilled for the next round. It appeared that everyone had had their fill, with groans of overeating and compliments on the food and animated discussions on the quality of each ingredient. Everyone stood suddenly and departed from the table. As I got up Ah Ma tugged me to sit down again, to which I assumed I was about to get an earful from the matriarch; an Ang Mo making off with her eldest granddaughter and pride of the family and even though Ah Ma did not speak a word of English, one got the feeling nothing would be lost in translation. To my surprise there was no censure, indeed no sign of disapproval at all, however much to my astonishment, a second 20 or so people had begun to sit down and all the food was being returned to the table, dishes replenished; suddenly I realised this was second sitting, the clan being too big to all dine at once. Alas, we started again and it all became clear to me why Ah Ma was taking such small helpings each time; she knew she had to pace herself as there was round two. Not wanting to lose face or disappoint my second round of guests who had taken up position and were tucking into the food, I headed straight back into the trough with earnest; draining glasses of wine, beer, whiskey and cognac and devouring dish upon dish. At the end of the second sitting everyone had gathered around, numbering in the fifties by this stage. Ah Ma had the attention of the table and was describing something animatingly in Cantonese to the boisterous crowd; then turned to me, pointing a finger and said “Lap Sap Tong!” to which everyone erupted in raucous laughter. My wife turned to me to translate; apparently I would now be known as Lap Sap Tong – Garbage Bin! This is of course a term of endearment and Ah Ma and I have gotten on famously since, Ah Ma always greeting me with a smile and saying (in Cantonese) “You’ve lost weight” to which I always reply “You look younger”. Money is the yardstick in the Chinese vernacular and giving of Hóngbāo a precise and significant ritual that favours the very young and the very old, but punishes the wallets of all in the middle. Symbolic of prosperity and your standing; the fatter the red packet handed to Ah Ma the better, and it needs to be crisp brand new notes of high denomination. The children and unmarried get a token Hóngbāo from the married and elders; mind you this can mount up to a handsome purse once you’ve done the rounds; perhaps this explains my resistance to be dragged to the altar. On the first day of Chinese New Year, our clan also meet for Monks breakfast consisting of vegetarian specialities, a Chinese ritual on the 1st and 15th of every month to cleanse the body, although rarely practised. The menu is actually fascinating in its detail; Chinese dried mushrooms that are soaked overnight in water and have a rubbery almost Abalone type consistency but are very tasty. And other mushroom varieties that look like seaweed and taste like bark. 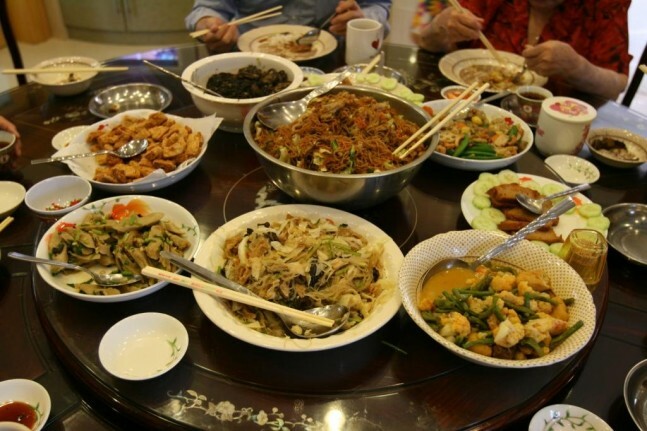 There are several tofu and bean curd skin dishes, some fashioned to represent meat and terrine-like in texture, others stir-fried cabbage, carrots and glass noodles, all rather intriguing. The following day, one of the Aunties cooks Wonton soup noodles (Hong Kong style) and another noodle dish with slow braised pork belly and offal with is absolutely delicious; all perfected over decades and superior to anything you will ever encounter. There’s a steady procession of relatives and friends dropping in all day for this delicacy, no one misses it and there’s always plenty of banter on where one should be eating in Ipoh; the obsession with food ever-present – as one of our Aunties says, “Life is filling in time between meals.” Yes, that’s where my theorem and logo originated. One of my Ipoh obsessions or now more an addiction is Roti Canai, something I now have for breakfast at least twice a week. It cannot be good for me, as the waistline is evidence, although it can’t really be bad for me either, as its just egg, flour, water and fat combined to make elastic dough. It’s that last ingredient that’s the problem; fat or in this case ghee, which is clarified butter. You see, it all started because just a few doors away from the in-laws house is an Indian food stall that has been serving up Roti for over 30 years, and it was until recently, my benchmark. I used to watch with amazement the Roti cook needing away at his dough, carving off a chunk and flipping it expertly in the same way a pizza chef twirls and expands to size, only this is to the thinness of stockings then folded into layers. However, Roti (practically everywhere) is not what it used to be, like pizza dough, unless you make it yourself, the quality goes out the door. And everyone buys in premixed Roti dough now (I have spied the telltale commercial boxes wherever I go) and it just does not seem to have the crispy, flakiness on the outside and fluffiness on the inside – it seems flat and… doughy. In fact what I usually have is called Roti Telur which has an raw egg folded in the layers of dough and then fried, served with either a yellow lentil or mutton curry to dip into. In Singapore they call it Roti Prata and for the record, my favourite stall is Mohd Faisal Eating Stall 01-06 at the Ghim Moh wet market, where I read the FT and watch a different world go by. But what to do about the premixed commercial dough: another culinary tragedy and victim of progress on our steady march towards mediocrity. 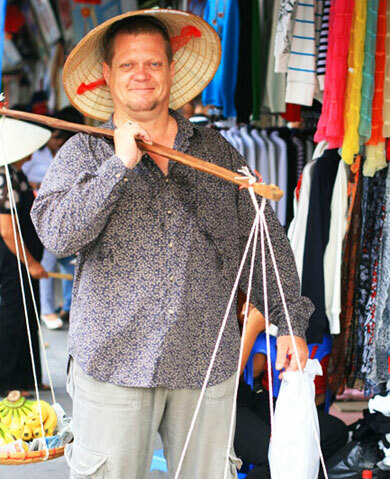 And Ipoh might well be the last bastion of real street food in Malaysia as even Kuala Lumpur natives make their way here for a rustic food fix and the famous Ipoh white coffee. You will need to have a cast iron constitution though as there is a certain level of grunge and borderline hygiene in many outlets – or you could say hovels and I am being generous in some instances. But that’s what makes the food taste all the better, is it not? 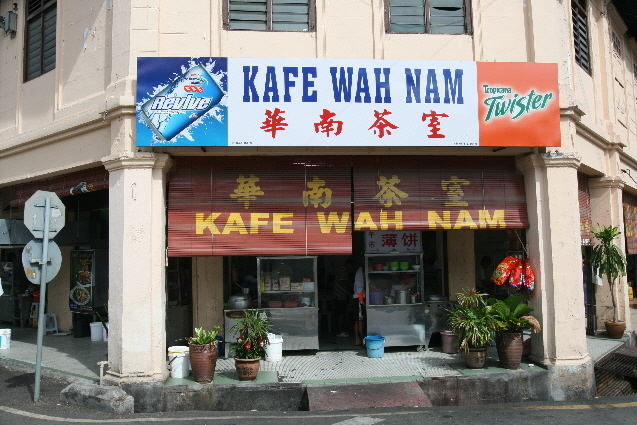 Most Ipoh food stalls tend to be in semi-open shop houses with the streetscape an outrageous kaleidoscope of signs and billboards. The more popular eateries tend to be the best well-known hawkers in cartels situated in corner premises that have extra crowd pull and run by a central proprietor renting out spaces and will usually run a cafe (kafe) and all the drinks and breakfast add-ons. Ipohnian’s tend to eat like Singaporean’s, frequently and at any time of the day, and you sometimes wonder if anyone is actually doing any work in the town at all with the popular spots constantly packed to the brim. Indeed, there is a special technique in getting a table in eateries where one needs to scan the room quickly to see which table appears to be nearing the end of eating, and then hover right over them, glaring at them constantly and making sure they feel as uncomfortable as possible, and feel compelled to move along. Is there such a thing as Ipoh cuisine? There is most definitely a strong Chinese influence with the thread of about70 percent of the population being of Chinese descendents, although my sources tell me that the number of Malay people moving to Ipoh is growing. There are certainly a lot of Chinese-influenced regional dishes and interestingly not your usual Cantonese dominance, rather a predominance of Teochew and Hokkien dishes; that said, not emulating authenticity as there is an underlying element of Nonya and a tendency towards spicier, stronger flavours. Much in the same vein as Penang, Ipoh is a melting pot of constituents and its food and cooking has been shaped over decades by different cultures, cross-cultures, intermarriages – both Asian and European – and I certainly perceive, from my long exposure to my wife’s clan, that the eating culture is very much permeations of Chinese and Malay, also with traces of Indian and Indonesian. Put it this way, when sitting down to a family meal with my clan, there could be a spread consisting of Assam Laksa, Nonya Chicken Curry, Steamed fish, Otak-Otak, Teochew Braised Duck, Long Beans in Sambal, Beef Rendang; a multi-cultural-cuisine melting pot. 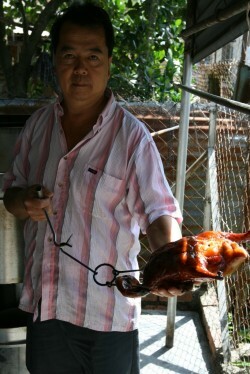 And the best Chinese roast duck to be had in Ipoh? Unquestionably Restoran Oldfriend; don’t you just love the name. I was given a back-kitchen tour by the proprietor and shown his duck ovens and techniques of marinating, a wandering palate exclusive to which pictures can be view on my website. Adding to Ipoh’s mysteriousness is the most civilised (western), if not esoteric establishment in the entire Malay Peninsula, ‘Indulgence’; a completely wacky, modern boutique hotel and eatery that is more urbane than anything I have encountered in Kuala Lumpur, or Singapore for that matter. Housed in a magnificent old British Colonial Mansion on the well-manicured, bougainvillea lined, stately boulevard, Jalan Raja Dihilir, one feels like you have stumbled upon a film set for E. M. Forster’s ‘A Passage to India’. Once inside you quickly adjust your timeline to modern fittings, colours and contemporary art with main dining room exuding character and warmth; a room that makes it easy to relax and eat. It is indeed a very personal space with the levitating charisma and passion of chef-proprietor Julie Song filling the room. Now here is one dynamic and idiosyncratic lady, pursuing food and pleasure with inexhaustible conviction. Song describes her food as Modern European yet I sense some Australian-freestyle and she admits her larder of ideas is greatly influenced by her regular trips to Melbourne and interactions with chefs like Andrew McConnell. Actually, she started as a pâtissière with a small shop-house café serving up cakes and coffee, which she still does, to perfection, and this is unquestionably the best latte or espresso you will find in all Perak. However I have to point you towards her salads, without a doubt the most innovative and impressive combinations of textures, colours and flavours you will encounter and I cannot think of restaurant – anywhere – that does salads so well. Michelangelo’s Pizzeria, hardly an original name but it sure is unique in this part of the world. On discovering the place, I spoke to the proprietor at length, a native of Chicago and good old American boy asking how the hell he ended up in Ipoh. Of course he met an Ipoh girl, in Chicago – need I say more! 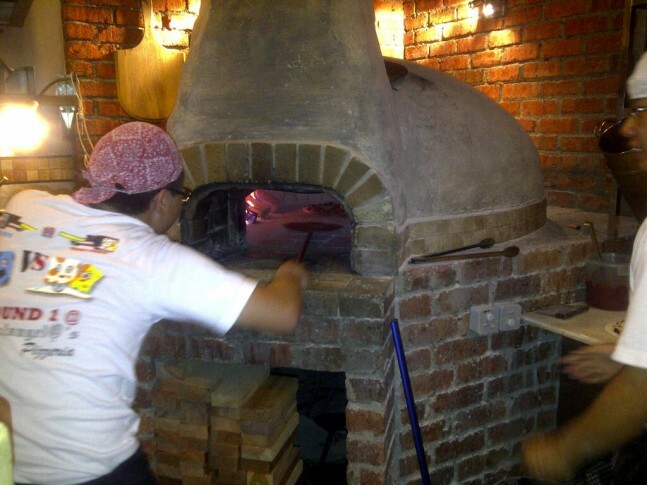 Having had his fill of the corporate world, he decided a new challenge was in order and bringing genuine American Pizzas to Ipoh would be sufficiently challenging. And before you think these are thick-crusted abominations that make Italian’s cringe; they make thin crust pizzas that are in his words, “authentically Chicagoan and not in any way compromising flavour or ingredients, delivering a most satisfying and wholesome experience.” And I believe him. The pizzas are great. 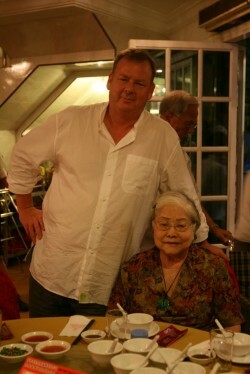 I could continue at great length on Ipoh food, to frank, about the only thing going for the place. Actually, apart from the heat build up from being on the valley floor, it is surrounded by stunning mountainous jungle scenery and you’re the intrepid type, I could always hook you up with one of my Uncle’s to take you hunting wild pig. Now there’s an adventure. Not beating around the bush, Ipoh will be challenging for some. 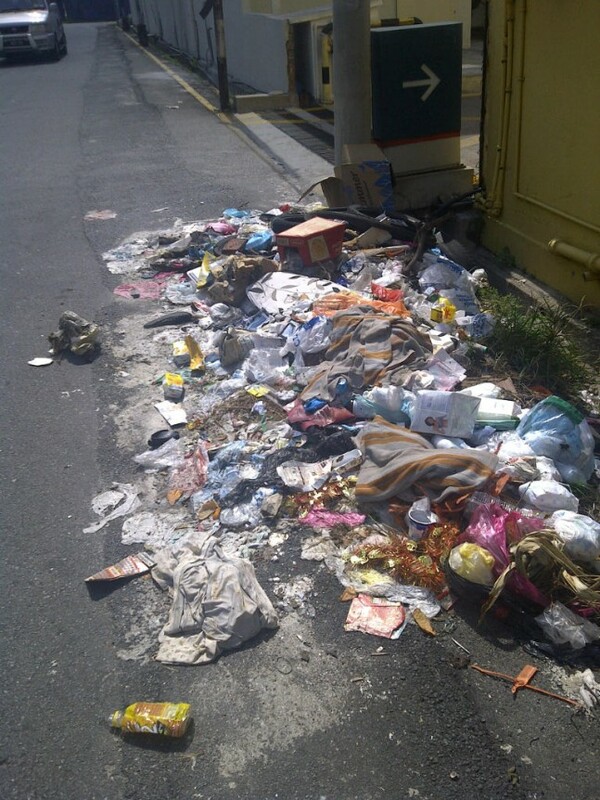 It’s hot, grimy and there’s rubbish everywhere. It’s something I can’t reconcile – how people can throw so much rubbish around the streets – like the actually save it all up, then drive around the streets spreading it all over the place. It’s like this in Penang too. Actually it’s the same all over Malaysia and it burdens me greatly as it is otherwise such a visually enticing country. I have yet to explore the old tin mines, having this fascination with the old gold mining days in New Zealand, although I suspect I might be disappointed in this more industrial type of mining, and I doubt if much historical has been preserved. Nope, it’s the food you come for and everyone agrees Ipoh food is good; but you need local knowledge and a courageous appetite. There is a chance you could fall for an Ipoh girl… and should that happen, you’d best come to me for a bit of advice.